Serving fans of Gerry and the Pacemakers on the internet since February 28, 1997. At this location since August 16, 2009. 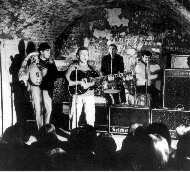 One of the top Merseybeat groups of the early 1960s, Gerry and the Pacemakers followed the Beatles and many other British music groups on the "British Invasion" of 1964. Remembered for such hits as Ferry Cross the Mersey, How Do You Do It?, You'll Never Walk Alone and I'm The One, Gerry and the Pacemakers still enjoy some well-deserved popularity, and continue to tour regularly. Here are some pages with further information on Gerry, the Pacemakers, and anything else of relevance. Gerry DVD Released in September '09! Release of the first DVD covering the classic era of Gerry and the Pacemakers, including 15 song performances. Here's where I'll post any news pertaining to Gerry Marsden et al. that I come across, like tour dates, new releases, or whatever else jumps up and attacks me. To respond to the one question which keeps passing through my inbox: the film "Ferry Cross the Mersey" is not available on (commercial and legal) video release, and I am unable to help people get a copy, as I do not have one myself. Occasionally a pirated copy pops up on eBay, which you are welcome to check, but I can offer little more assistance to this end. 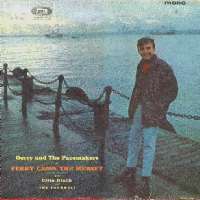 A listing of all the CDs of Gerry and the Pacemakers I know about (though I have had difficulty keeping up with the myriad greatest hits releases of recent years). A complete (?) listing of songs recorded by the "classic" Gerry and the Pacemakers, now including a discussion of a few different ways to go about getting the complete 1960s recordings of the Pacemakers. As with most other groups, there are different mixes and takes of the same song that have been released over the years. Here are the major ones by the Pacemakers. A selection of lyrics to Gerry and the Pacemakers songs. Guitar transcriptions of various Pacemaker songs. An account of my seeing and meeting Gerry Marsden at a concert in Toronto a few years back. A listing of the known books and magazines published pertaining to Gerry and the Pacemakers. A brief history of Gerry and the Pacemakers which may answer some of your questions. Off-site link. Good overview of the band. A listing of all known television and film appearances of Gerry and the Pacemakers. A few pictures of Gerry and the Pacemakers. Going mad looking for some piece of Pacemaker paraphernalia? Looking for a 35mm print of Ferry 'Cross the Mersey? (If such a thing is even available anywhere...) Email me with your list of "must have" items, I'll post it here, and we'll hope for the best! Links to various sites that you may find interesting. Gerry's new "official" presence on the internet for fans and followers of Gerry Marsden and the Pacemakers, replacing an old site that was updated even more infrequently than mine. I hope you find something of interest here. Any further information you might be able to give on the band and their solo ventures would be much appreciated. I do get the occasional e-mail asking whether this site is still active, as it hasn't been updated too much in recent years. The short answer is yes, though not as actively as some might like. This is predominantly a reference site, meant to give fans and onlookers some historical information. I see the focus of this site being the "classic" era group's legacy, and some day would like to add more detailed bits like a fuller song variations list (which is still a work-in-progress, though I may some day break down and post it as-is), maybe a gallery of concert tickets and tour programmes, and so forth. With the pending demise of Geocities, I have moved this site to a new URL after more than 12 years at its old location. The design of this site has not changed since going online in February 1997, and I have absolutely no intention of upgrading it now. I personally like the mid-90s HTML look--I am sure that smartphone users may disagree with such a statement, but as I view smartphones as second only to Facebook in destroying humanity's primary redeeming qualities, I won't be swayed. Please note that this site is neither affiliated with nor sanctioned by Gerry Marsden, Gerry and the Pacemakers, EMI Records or any other agency, hanger-on, groupie or maid service associated with those Great People Or Groups. If anyone feels their copyright has been violated by anything on this site, please contact me so that we might trade barbs civilly and come to some agreement without my having to decide whether I shall attempt to cover my posterior in a fair use or fair dealing jurisdiction. Last updated: 4 January 2013.